This study guide is designed to enhance your understanding and implementation of the evaluation system presented in Principal Evaluation: Standards, Rubrics, and Tools for Effective Performance, an ASCD book authored by James H. Stronge and published in 2013. Principal Evaluation provides a research-based set of performance standards, data collection tools, scoring rubrics, and other resources for accurately and comprehensively measuring principal effectiveness. To get the maximum benefit from the book, apply your own knowledge and experiences to the issues explored within its pages and reflect on your own beliefs and practices. Consider whether the leadership assessment practices in your school or district are sound. The questions provided in the study guide for each chapter are designed for reflection, either on your own or with an evaluation design team. Part 1 of the book provides a conceptual framework for designing a principal evaluation system and outlines the research background and major components for such a system. Reflect on how the system might align with established practices in your school or district. Why does principal evaluation matter? What are the basic purposes of a principal evaluation system? What is wrong with traditional principal evaluation practices? What are the obstacles to quality principal evaluation system? Principal evaluation is primarily about documenting the quality of leadership performance. It is also about helping principals improve their performance and holding them accountable for their work. How can we document a principal's performance fairly and rigorously? How do we make room in principal evaluation systems for both accountability and professional growth purposes? These two purposes are not competing; instead, they are intertwined throughout the evaluation process. Principal evaluation should tie evaluation not only to principal improvement but also to school improvement. How can we develop a sound evaluation system that revolves around the vision and the goals of the school and of the school district? The design of a principal evaluation system starts with accurate and appropriate descriptions of the principal's roles and responsibilities. What are the expectations for the position of principal at your organization? A common understanding of principal effectiveness is an important foundation for any principal evaluation system. Use this "Design a Principal" activity with district- and building-level administrators. Ask them, either individually or in small groups, to fill in the figure with words and phrases that they think make up the qualities of an effective principal. Based on your understanding of the research on effective principals, government policies, and theories of school leadership, what practical, research-based performance standards, constituting a balanced measure of both the principal's managerial responsibilities and leadership roles, should serve as the foundation of the evaluation system? In recent years, as the field of education has moved toward a stronger focus on accountability, more and more states have started to use student academic growth as a measure of principal performance. This chapter also advocates for an evaluation system that examines not only principal knowledge, skills, and practices, but also the results for student learning. What are your perceptions of this trend of reform? Despite the fact that proper assessment and evaluation of school personnel is fundamental to successful schools, this key element of school reform is too frequently neglected. What do you consider the key features of an effective principal evaluation system? Recall the Joint Committee on Standards for Educational Evaluation's four essential attributes of sound evaluation practice: propriety, utility, feasibility, and accuracy. What is the difference between performance indicators and performance standards? What information should be collected to document a principal's performance? The creative use of multiple data sources can provide a more accurate measure of principal performance than would be available through a more narrowly defined approach and provides a stronger platform upon which to build realistic improvement plans. Consider the five data sources recommended in the chapter: self-evaluation, observations and school site visits, document logs, climate Surveys, and goal setting. What are the advantages and disadvantage of each data source? How can they be aligned with each of the seven performance standards? How many observations or school site visits should be conducted annually? Who can provide documentation relative to the principal's performance? How can you ensure the procedures for collecting data are as simple and job-embedded as possible to prevent undue burden to either the principal or the evaluator? How can you determine that the data collected allows for consistency across situations and evaluators? Should assessment be adaptable to the principal's position or level of experience, given that the needs of a beginning administrator are different from those of a veteran administrator? Does the management system meet your content and technical requirements? Is it accurately aligned with your evaluation system? Who provides the initial configurations and ongoing training, and what are their qualifications? How are the data captured? Where are the data stored? What access does the district have to the data? Could the management system be customized or expanded (for instance, by adding new standards, rubrics, or forms)? What are the analysis capabilities of the management system? Could it conduct the queries you need? What are advantages and disadvantages of using rubrics as instruments for providing ratings? How might you establish procedures to ensure that information collected for evaluation will be systematically and accurately analyzed? How could you develop inter-rater reliability among evaluators so that they will weigh the data collected from different sources and provide consistent ratings? What are key differences among the ratings of Highly Effective, Effective, Partially Effective, and Ineffective? In conventional principal evaluations, principal ratings suffer from the same problem of grade inflation that afflicts teacher evaluation: Most educators are rated as top performers. How can you ensure that the scoring guide will limit evaluator subjectivity and the scores will be differentiated to reflect the actual quality of performance? The summative evaluation represents where the preponderance of evidence exists, based on various data sources. What does this mean? How much weight should be placed on each measure of leadership effectiveness? What have you seen work well in principal evaluation systems? What challenges do you perceive with evaluating principals? What are the keys to improving principal performance? Regardless of how well an evaluation program is designed, it is only as effective as the people who implement it. How can you ensure that people with the necessary qualifications, skills, training, and authority are in place to safeguard the credibility of the evaluation process? How can you ensure that adequate time and resources will be provided for the evaluation activities, so that the system can be effectively implemented, the results are defensible, and follow-up activities can be provided? How can a principal evaluation system be connected with school improvement? How can the needs of individual principal and the needs of the school be balanced? Goals that are valued by both the individual principal and the school are vital to a successful principal evaluation system. How can you develop purposes and goals that are mutually beneficial to the individual as well as the institution? Effective communication plays an important role in every aspect of the evaluation process. From the beginning discussion of identifying the needs/goals of an evaluation system through the actual implementation and summative evaluations of performance, stakeholders should be informed. What are the guidelines for effective communication? How should feedback be provided to principals to improve practice? How can evaluation results be used to help the principal identify areas needing improvement and serve as a catalyst for accomplishing those desired improvements? How can a structure be built allowing the use of data generated by evaluation in developing professional development plans? Under what circumstances might a school administrator be compelled to take part in a Support Dialogue and a Performance Improvement Plan? What are the challenges you foresee with rolling out your principal evaluation system, and how might these challenges be alleviated? What might the district as a whole do to assist in implementing the evaluation system? How will you communicate the details of the evaluation system? Are school leaders being evaluated accurately? Do their summative evaluation ratings correlate with student academic growth? Are school leaders improving their performance over time? Are principals receiving constructive and informative feedback? Do principals believe they are being evaluated fairly? Is the evaluation process ongoing and connected to school improvement goals? 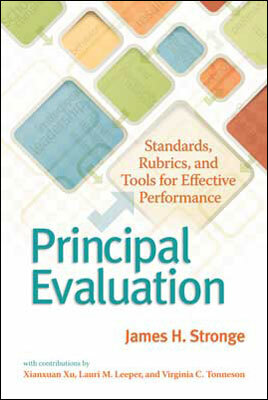 Principal Evaluation: Standards, Rubrics, and Tools for Effective Performance was written by James H. Stronge. This 160-page, 6" × 9" book (Stock #113025; ISBN-13: 978-1-4166-1527-9) is available from ASCD for $21.95 (ASCD member) or $28.95 (nonmember). Copyright © 2013 by James H. Stronge. To order a copy, call ASCD at 1-800-933-2723 (in Virginia 1-703-578-9600) and press 2 for the Service Center. Or buy the book from ASCD's Online Store. Copyright © 2013 by James H. Stronge. All rights reserved. No part of this publication—including the drawings, graphs, illustrations, or chapters, except for brief quotations in critical reviews or articles—may be reproduced or transmitted in any form or by any means, electronic or mechanical, including photocopy, recording, or any information storage and retrieval system, without permission from ASCD.